This table is made from one board of bubinga, also known as African Rosewood. This particular board measured 45.5 inches wide x 19 feet long when we found it at Good Hope Hardwoods in Pennsylvania. We cut it at 14' for the table and used the remaining five feet to face the sideboard. 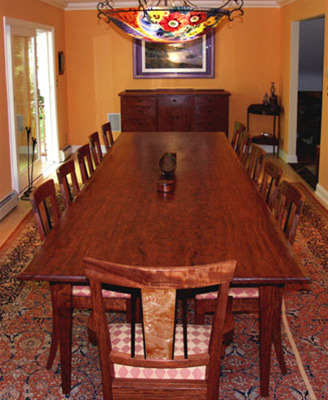 Really wide planks of bubinga are sometimes available up to 52" wide and 20' long. Right now, they might be considered 'reasonable' considering what they are, giants of the forest. Pricing estimates range from $750. to $900. per LINEAL foot depending on the design. Shown with the table are our Contemporary Transitional Chairs, item # 173 in the seating section. The chairs shown are bubinga with walnut and maple burl accents.